We are a family owned and operated professional fishing charter service; operating on Lake Ontario. We offer full day or half day fishing charters. 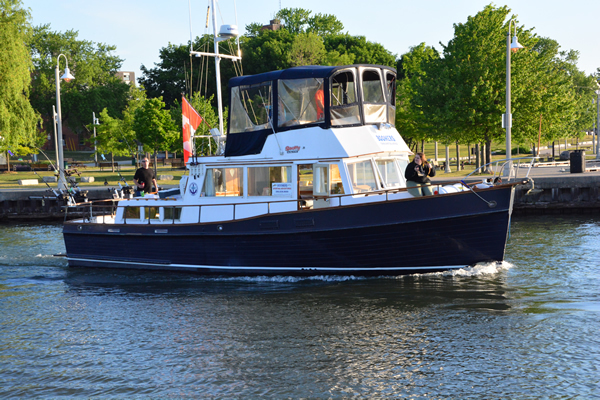 Hearn Fishing Charter is based out of the Bronte Harbour Marina. The relaxation and exhilaration as your party boards my professionally crewed, well appointed and fully equipped sporting yacht, designed to easily handle all offshore pursuits on Lake Ontario. Once pleasantries are exchanged and you are comfortable, we leisurely depart the serenity of Bronte, our beautiful harbour. The breeze gently rushes through your hair as we power up in anticipation of finding our quarry, trophy Chinook Salmon and Trout or leisurely cruise the lakefront. Your fishing adventure starts in Oakville from Bronte Outer Harbour aboard our very comfortable 42' yacht. She is fully equipped and crewed for a great fishing experience pursuit of trophy Chinook and Coho Salmon as well as Rainbow Trout. This is an adventure that dreams are made of. During the Great Ontario Salmon Derby July 1 to August 19, should you catch the largest King Salmon, you win a new truck. Each week the largest wins you $10,000. Entry is included in your fishing adventure a $115 value per person. Your pleasure cruise adventure starts from Bronte Outer Harbour as we leisurely cruise the north shore of Lake Ontario between Harnilton and Toronto. 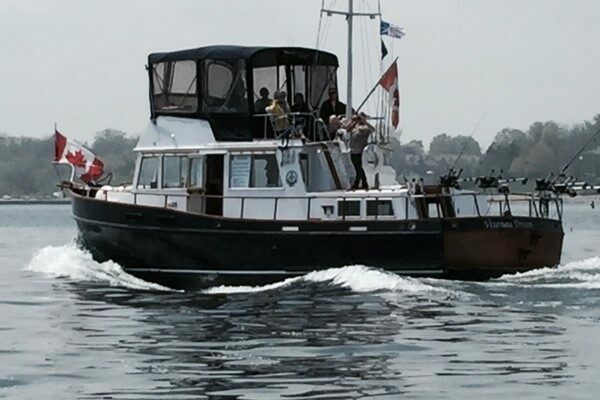 Our Grand Banks 42 Classic yacht, comfortably accommodates up to 16 guests for group events. Now you can host your exclusive private gathering, party, birthday, wedding…etc. The options are yours to design and mine to make it happen. We also do celebration of life. Morning, afternoon and full day fishing charters are available.